I hope you all had a wonderful weekend....mine was very relaxing & I truly enjoyed my family time!! Today's card is supposed to have more of a *vintage feel*﻿ to it but I'm not completely sure of my vintage style yet. Now don't get me wrong; I do LOVE the final look of my creation & I think I worked with the colors of the DSP I used very well too....I guess I'm just my own worst critic!! My only wish is that you enjoy it!!! I'm off to do laundry, clean my house & stamp....maybe not entirely in that order but at least it'll all get done LOL! Thanks so much for stopping by & have a great rest of the day!! Very pretty! I think your card definitely has a vintage feel to it. 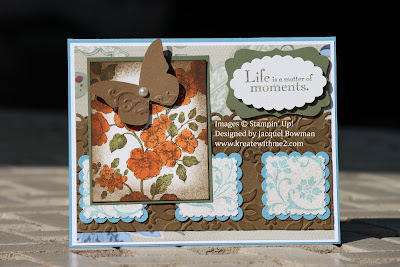 Love the butterfly and the embossing. Gorgeous work! I love the colors and textures. Your cards are always a treat to look at. oh it's gorgeous and i'd say vintage for sure!!! wowza! stay cool sunshine and PRETEND you've got one of those umbrella drinks right next to you! I love your card, the colors are so perfect together. Love all the textures and the DP with the distressed feel with the ink. Great job. Beautiful card! I love the embossing and that sentiment. The butterfly is such a lovely touch,too! Your card is beautiful. Love the vintage look to it. Yes, it's there. This is great! I love how you embossed just a little bit of the butterfly. Great effect! Great vintage card! I love all of the detailing and layers. This card is beautiful, I love how you make all the different elements work so well together, it also looks like you had fun at convention. Oh, Jackie--this is GORGEOUS! LOVELY--it took my breath away! Wow Jackie, this is gorgeous. What a fabulous job combining colors, patterns and elements. Definitely a beauty! Hey there, Jackie! I hope you are doing well. This card is gorgeous. Looks like you had a fab time at convention, too! I think you captured the vintage style beautifully, Jackie...the colors and papers are sooo pretty and I love how you added the butterfly!!! This is so pretty! I love the color combo you chose and the main image is just beautiful! Gorgeous card, Jackie! I love all the colors and details! Jackie, this is gorgeous. It feels like forever since I have visited you. I apologize for the delay in commenting. Looks like you had fun at convention. Can't wait to see some of your new inspired creations. Stunning card, I love everything about it. You are a true artist. Oh Jackie! I love, love, LOVE vintage, and this card is no exception! Great layout, beautiful colors and I think it definitely has a vintage feel to it. Beautiful!